I have a confession to make. I have a huge bag of dates hidden in my refrigerator. And my refrigerator is far from huge. It is taking up a lot of premium real estate in there, although, since I have shoved them to the back, C hasn’t noticed yet. It all started with a trip to a baking supplies store that lies off the beaten path. The type you have to make a special trip to visit. As you wander the small aisles, cramped with all manners of confectionary ingredients and tools, you realize you must buy something, more than something, because if not, wouldn’t your trip be a waste? After all, you made this trip especially for this store…were you going to leave empty-handed? Of course not. So in your basket goes a bag of confectioners’ sugar, an oversized wire whisk, bottles of vanilla, cupcake papers, and a big bag of soft, dark, and very promising looking dates. I love baked goods that have dates in them. Actually, I also love savory dishes that include dates. I am no proof for their sticky sweetness, whether it be in a cookie or cake, or a dish of braised duck. So yes, buying this big bag is indeed totally and unequivocally justified. And besides, I already knew exactly what I wanted to make first. – Pre-heat the oven to 350F. Grease and flour an 8”x12” pan. – Melt the butter in a heavy bottomed saucepan on medium heat. Add the sugars and mix until combined. Remove from heat. – Stir the butter-sugar mixture a few time to bring the temperature down slightly, just so that it won’t scramble the eggs (it will still be hot). Add the eggs one at a time, stirring after each addition with a wire whisk to make sure each egg is incorporated before adding the next. – Add the dates and walnuts and mix with a wooden spoon (all the pieces will just gunk up the whisk so it’s best to switch). – In a separate bowl combine the flour, baking powder, baking soda, and salt. Mix well with a whisk (I always like to do this to get rid of lumps and make sure my dry ingredients are fully combined). Add this to the date-nut mixture and mix until just incorporated. Do not over-beat. – Scrape the batter into your prepared pan and bake for 35-40 minutes or until toothpick inserted in the middle comes out clean but not dry. – Cool completely in the pan before slicing. If you’d like to be traditional, wrap individual slices in foil and cellophane. Not only does this make them present-perfect but it keeps them moist for a good while! This was, without a doubt, an excellent vessel for my dates. This can be compared to, I suppose, a Blondie or a butterscotch bar…chewy and caramel-y in flavor. Take that, and then stuff it with dates and walnuts, and you’ve got (quite literally in my book) Food for the Gods. 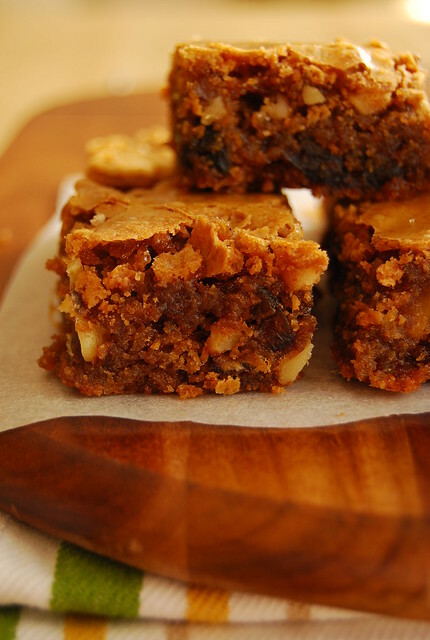 It is moist, dense, chewy, sticky, molasses-y goodness…shot through with musky bits of dates and crunchy nuts. These make for lovely gifts…or you can simply cozy up with a plate of them and a hot cup of coffee (and maybe even a real live date!). haha, I have a baking store like that. One thats quite the trek and I'm pretty sure I wouldn't leave with out buying something. Then you end up buying lots, probably more then you need, but hey, it's gonna be a while before you might even considering going there again. right? These looks delicious! I love dates too! There is some real innovation that goes into your breakfast foods. I have a bag of fresh dates in my fridge also. I like them with asliver of brie and a walnut half. OMG! This looks yummy, indeed! Hi! Please share the name and address of that baking supplies store. Definitely my kind of store. Would so love to go there. Thanks! this is my new favorite dessert and i haven't even tried it yet. love love love Food for the Gods — it's my absolute favorite cake bar! Recipe saved! I have fresh dates and would want to enjoy them as such but I have lots of dried figs begging to be rehydrated and be enjoyed either as marmalade or in this case as baked yummies. What do you think? I do love your breakfast series – I'm printing and compiling them for future and immediate inspirations. Hi Eric! Thank you 🙂 Sounds like a festival I would enjoy! Hi Maricel! It’s called SweetCraft and you can find them at 373 Boni Avenue, Mandaluyong City. You can call them at 5718008 or 5717858. Hi Anna! Hmmm…not sure. These actually came out less oily than other FFTG’s I’ve tried. Wish I could be more help! Perhaps you can email the magazine? Hi Mom-Friday! I know…it’s sooo good! 🙂 I love it too! Joey…next time, start with BROWNED BUTTER, cooled down as well before proceeding. It gives the bars a bit of nutty taste and aroma. Next time anyone goes to US, ask them to bring back for you BUTTER PECAN extract….this is what together with the browned butter makes mine different and people often wonder and want to know what is in my FFTG! Thanks for the info. Looks like I am heading there pretty soon! OH MY! I wish I could make this but that would make me have to consume all the calories since my hubby doesn't eat FFTG (Whuuutt??) … sigh! Gorgeous FFTGs!!! I have a similar recipe but how come mine are more cake-y? 🙁 i haven't figured out how to make it less cake-y and more like yours — dense and chewy. These look so delicious and are a nutritious treat. Can't wait to try these. Random thoughts: date-ricotta pancakes? Or ricotta/regular fluffy pancakes with syrupy stewed dates? With a hit of orange zest? Date cheesecake/cheesecake tart with a thin layer of date filling? Brie/camembert/gruyere/manchego-stuffed dates? I'm not entirely a fan, although I do enjoy the odd Medjool date snaffled from the hubby's stash… ! mmmmm dates! these look great! Hi Betty Q! Can I just reach into my computer screen and hug you? Like right now? Thank you thank you thank you for sharing your FFTG secret! 🙂 That sounds fantastic and I will definitely be trying it out next time! Hi DW! You can share them with friends and neighbors 🙂 That’s what I do (my hubby isn’t much of a sweet tooth)! Hi Iyors! Love them stuffed in bacon…mmm, will do! I had an aunt when I was a kid who always made this cake for me. I recently started baking and have always remembered this child hood desert that I craved for. Seeing your blog with the name "Food for God" on it got tears in my eyes. The best Food for the Gods recipe I ever tried! My tummy thanks you. My hips on the other hand hmmmmm……. Guess the ponies at Tagaytay wont be able to carry me anymore. I cut the recipe into thirds (only baking for 1). It turned out great! Hopefully, I can make the full recipe. Thank you for posting! !